Kindness takes us a long way when we want to give up. It helps us see possibility, the proverbial ‘light at the end of the tunnel,’ it helps us resist and reform a government that incites violence, openly lies, and uses propaganda to bolster its masses. You know how hard it is to want to give up. Every time you decide not to, it is an act of kindness in a world that needs you. When we see good people in the community doing something selfless, amazing, uplifting: we are going to feel that magnetic pull toward them because kindness is contagious. Kindness is consideration of the issues around us and concern for how they impact us; coupled with intentional action to make it easier to be a human. Kindness is the heart of Javelina. Without everything attached to it, we fail. We may still fail, of course, but we do it while supporting and uplifting one another. Who better to share defeat with than the people who supported you along the way? We tend to forget this part of the process when we suffer a blow. Kindness acknowledges the state of things and the necessity of moving forward, together. It is the difficult communication that keeps us connected. Think of a time since Trump was elected that kindness helped you navigate a conversation or a brutal news story. What do we learn about “sides” during these moments? How does seeing each other change when filtered through kindness? And how can self-kindness help when all seems completely lost? We know you know how difficult it can be to communicate about certain subjects with some people. Kindness means putting in the hard work to get through these conversations to an understanding and to use that understanding as a foundation for change. At Javelina, we know that what is kind isn’t necessarily the nice or easy thing to do or say. Being kind and being nice are not the same thing. You can be nice to someone without it necessarily being the kind thing to do. With kindness as a core value, we must address each other directly. It’s not always comfortable or easy, it takes courage to be kind. Have you ever worked in a place that operates on gossip and blaming? Not fun and nothing gets done as effectively as it would with good communication. Good, brave communication is kindness. Kindness means people are aware of how they come across to others and mindful of how they interact for the sake of the cause. Javelina’s climate is fast-paced and we don’t need to tell you what happens to change-engineers working on projects that require 42 hours in a day to maintain proper sleep and eating habits, to say the least. Kindness keeps us from falling back on being short-tempered with each other when we’re all completely stressed out. We know the work is too important to give in to snappiness and frustration. Kindness helps us to remember that we’re all on the same team. We carry on, especially when political work gets very tense, and when isn’t politics tense? We’re only human and Trump is President. We are operating within high-stakes times. To get through it: kindness. We’re not going to change the world through insincerity, lies, and bullying. It’s through kindness that we are able to listen to each other and form greater alliances. When a team (work, family, friends) chooses kindness as its foundation, they can get through anything together. When Javelina became the General Consultant for the Invest in Ed initiative earlier this year, our capacity was maxed out as our workload amplified. We were united behind the initiative, so coming together to determine how to deal with the extra work was imperative to its success. We aren’t saying there was no panic or stress, but, we supported each other. Then Invest in Ed got thrown off the ballot and that same kindness that got us through, lifted us up. Kindness is communicating sincerely. Insincere communication is full of trap doors. We avoid insincerity by delivering the truth, even when we must say something our client may not want to hear. The truth can be uncomfortable and disappointing. 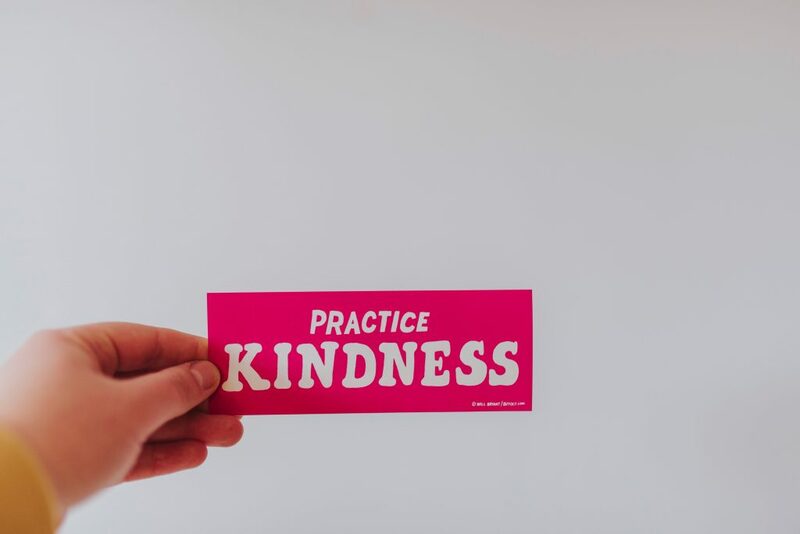 A common phrase around here is: “I wouldn’t be doing my job if I didn’t tell you that is not the best way to tackle this project.” Kindness is providing the information our clients need to be successful. Hopefully, we will be working together for a long time; how we treat one another during that process is the kindness variable. When you are kind to someone your body surges with serotonin, endorphins and oxytocin. This hormonal tonic reduces pain and blood pressure while promoting feelings of relaxation and being loved. The person/people you are kind to also experience these hormones, as do people who witness the act of kindness. Here is a quick, scientific rundown of the effects of kindness. Because kindness can fuel curiosity, it creates the space for us to hear each other, without our pretenses getting in the way. When we know each other’s stories, we can move beyond labels to core issues that change our world. Instead of thinking your neighbor is a socialist nightmare for wanting universal health care, maybe you can ask for a story behind his support. Our intention to change something can be motivated by an imbalance we have experienced or witnessed because we are paying attention to more than just ourselves. Kindness is considering other people and what they experience and expressing concern for how we can help make their lives easier. We know it isn’t always easy, but when it gets tough reach out for the person being kind to you. It’s a life saver.